Despite being all-new (for Europe, that is. It’s been on sale in the US for over 2,5 years already), and despite sales up more than 50%, the Ford Mondeo hasn’t been able to outsell the 7-year old Opel/Vauxhall Insignia even a single month this year. It the Passat has still outsold it by a 2,5 : 1 margin every single month but March. So it’s safe to say European midsized car buyers are yet to be impressed by the new Mondeo. The previous model sold twice as many times in 2008 and the generation before it again twice as many in 1999. Of course, the segment as a whole was much bigger at that time, but Ford can be glad they’re selling the same car in the US and China as well now, so they can still gain economies of scale. Or perhaps the fact that it’s no longer a European design, but a world-car instead has something to do with the lack of interest in the new generation? Below the top-3, the Peugeot 508 is relatively stable thanks to its facelift, but it’s in danger of losing its fourth place to the all-new Skoda Superb, which will start deliveries in Q3. Being a stretched Passat with the largest rear leg-room and the largest boot of the segment and a lot of new tech gadgets, and this all for a reasonable price, the Superb looks set to continue its success story. The three best selling Asian offerings in the segment are all down in the single digits, while the Citroën C5 and Renault Laguna are off sharply. The Laguna’s replacement, the all-new Renault Talisman has already been introduced and its styling is inspired by the Passat and Audi A4, but with a few French touches. Renault has called up Mercedes-Benz to help with the quality (perception), and it’ll hit showrooms in the last quarter of this year. The French hope it will score at least a #4 place in the segment next year, and I don’t think that’s too ambitious, even though it will suffer some cannibalization from customers preferring the all-new Kadjar crossover. For this year however, the Laguna is in danger of losing its top-10 position to the all-new Subaru Legacy and Outback, which already outsold it in April and May. 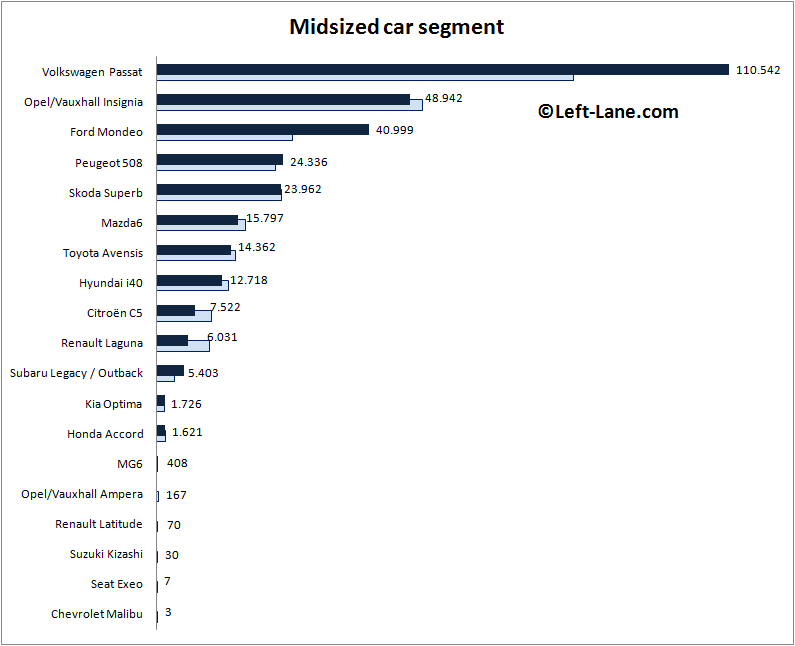 Also check out the ranking of the premium midsized segment, where the Mercedes-Benz C-Class has taken the lead from the BMW 3-series.